Environmentally aware, familiar and urban. Enjoy Vienna - live suburb! Citytrip and relaxation in the nature do not need to be opposites. Especially Vienna offers a perfect public transport network and gives the possibility to connect old and modern urban culture with outskirts and rest. We, Hotel Gallitzinberg, have something special for you: good location with view over the city, a familiar and eco-friendly atmosphere - only 25 minutes away from Stephansdom by underground and bus! As a ecology-minded business since many years, we make a point of sustainability. Even at breakfast buffet in the morning you will find local and biological products. We are trying to avoid unnecessary packaging and trash. Of course we do cleaning with eco-cleaning agent and eco-laundry detergent. At our hotel bicycles are waiting for being used by you and the bus stop is right in front of our house. So it is very easy and comfortable for you to abstain from your car. In case you need a break from Vienna sightseeing you can start for a walk or for a jogging session from the hotel. Or how about a day trip to Wienerwald? 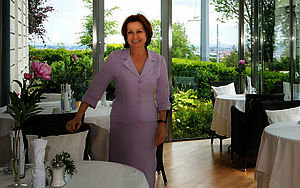 To operate an "Umwelthotel" (eco-friendly hotel) is not only about saving environment. We want you to have a stress-free visit in Vienna with fresh air, rest and relaxation. This is why you can expect all our hospitality and attention! We are looking forward to welcome you in Vienna!